Rats are extremely opportunistic animals, so even though some of the hallmarks of poor sanitation like uncontained garbage and litter often attract rats, cleaner environments can be prime spots for rat invasions, too. Rats will eat bird seed, pet food, grains, meats, fruits and vegetables. Pretty much anything they can wrap their paws around may make it on the menu (or at least be worthy of a quick gnawing). Once rats have made themselves at home, however, the situation does become decidedly unhealthy. 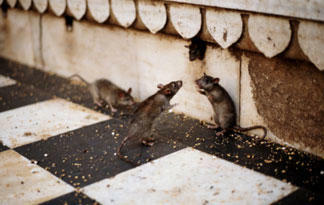 Rats can pass on dozens of diseases to other species, both directly and indirectly through infected fleas or mites.